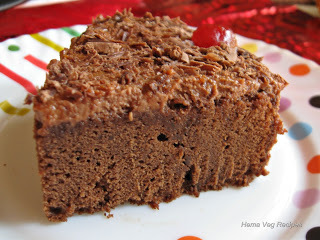 Hi I am Hema and welcome to my world of vegetarian recipes! 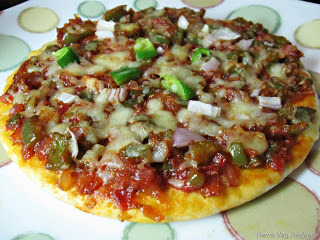 Here in this site I feature recipes of various categories from India and beyond – Snacks, Vegetable Curries/Sabzis, Veg Salads, healthy Fruit Juices/Shakes, pure Indian Breads – breads like Vegetable stuffed Parathas, Rotis etc. 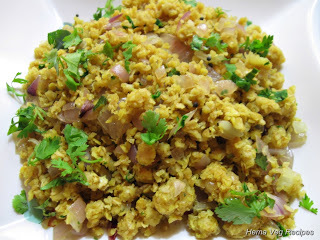 I also feature varieties of Rice Recipes like vegetable based Pulao recipes, fried rice dishes, Pongal etc. 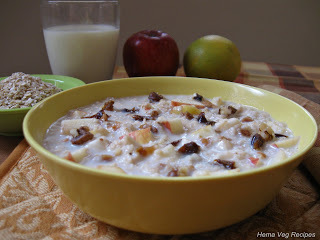 and a number of Veg Breakfast Recipes to help give healthy start to your day. 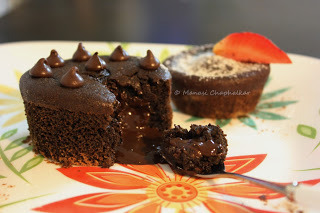 Last but not the least, checkout my collection of Eggless Desserts and Sweets recipes often made during special occasions. 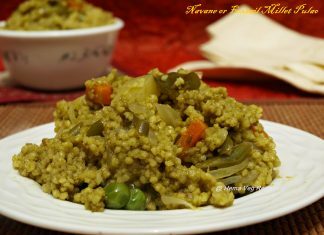 Pulao made from the Millet Navane(Foxtail) is a complete food for lunch as it contains rich amount of fibre and multivitamins, though its taste is little lacking the kick, when consumed hot it gives the fullness satisfaction. 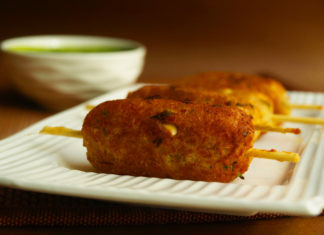 Either for snacks or as starters, the Paneer Seekh Kebab is a good item to satisfy the craving taste buds. 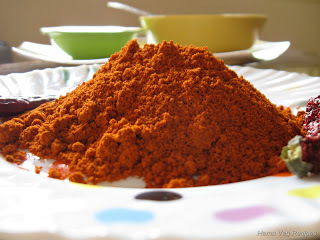 Make at home and be healthy. 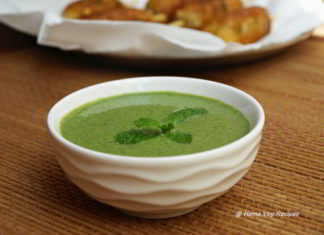 Green Chutney for Starters is a very good appetizer which contains fibrous leaves like pudina and coriander, along with mild spices. 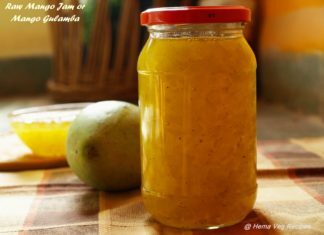 Mango Jam or the Gulamba is a sweet side dish that can be savoured with Dosa, Chapati or Bread. This easy to make jam doesn’t contain any preservatives. 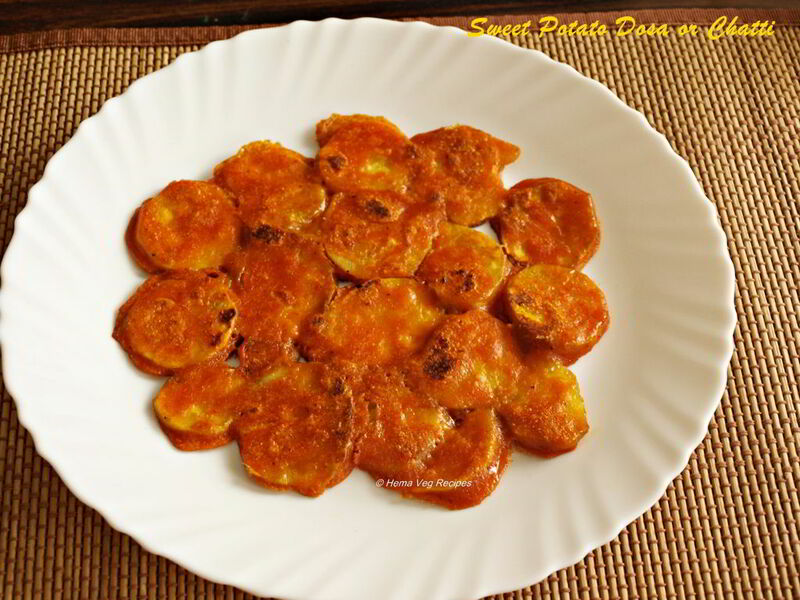 Tingly tangy raw mango tokku can be a typical side item for licking along with dosa, chapatti and south Indian rotti. 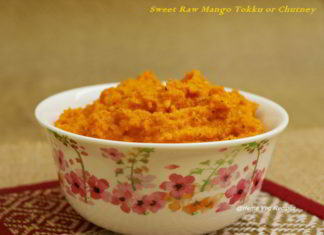 This special tokku can be stored in refrigerator for a month without any preservative. 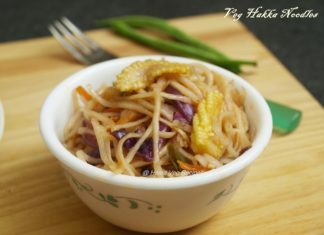 Veg Hakka Noodles is a tasty dish made with different types of sauces and vegetables. The lengthy flat noodles and colourful long cut vegetables is very tempting to many people. 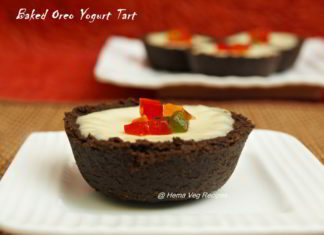 Making Oreo Yogurt Tart can be as exciting as the appearance of it giving a slight smooth and delicious taste for an evening snack. 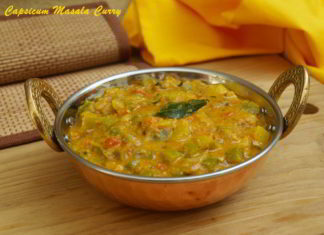 Capsicum Masala Curry is a very tasty and lip smacking dish which can be devoured with Chapati or Phulka. 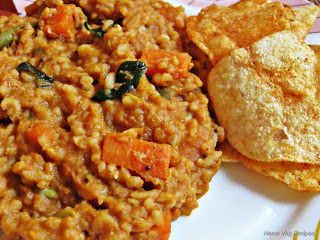 Chatti, name to listen is quite funny; but this Sweet Potato Khara Dosa is a very delicious food. 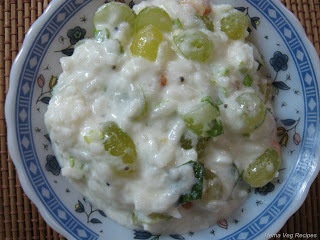 This filling dish is an anytime dish being colourful and nutritive. 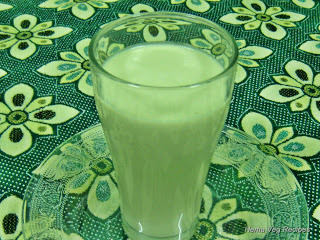 To quench the burning thirst and rejuvenate oneself, Mint Ginger Lemonade is the best summer beverage to choose. Mint’s cooling property makes you feel floating in air.